Utah’s Highway 89 meanders between small towns offering a window to the past look at how ranching and rural living were before high speed travel. A time when “locavore” wasn’t a buzzword but a necessity. Country residents had to be self-reliant. Homesteading meant that each farmer produce a wide variety of products that their household required, and used money only for what they couldn’t trade. In both Sanpete County and Sevier County, its southern neighbor, there are farms and abundant land, but a lack of water and “water rights” create struggle and tension. This former ideal cattle area has seen better days. Fed by the Sevier River, the Yuba Reservoir currently is about one third of its normal size. Next to the reservoir is one of Utah’s largest dairy ranches. The Bown ranch consists of 1,200 Holsteins on two farms totaling 1,750 acres. “Most of the smaller dairies have gone under,” says Trent Bown, a fifth-generation rancher. Bown’s philosophy is simple: get bigger or die. Each cow on the Bown ranch produces an astounding 85 pounds of milk per day (about 12 gallons per cow), an achievement of which they are proud, as evidenced by the nod Trent gives his brother in verifying this fact. 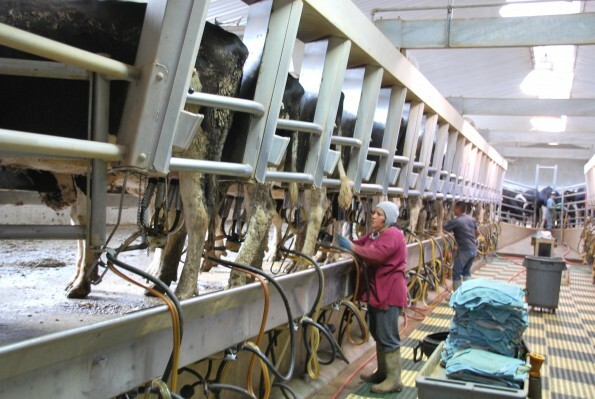 They produce raw milk for a co-op which supplies milk for Cream o’Weber and Chobani yogurt (Dannon). Trent inherited the farm from Bob, his father, son of Cecil who inherited it from his father Elton…. Trent can’t remember his pioneer great-great-grandfather’s name. “It’s going to bug me,” he says. Trent inherited this dairy and his water from pioneer ancestors, but there is nothing traditional in a modern, industrial dairy. Everything must be state-of-the-art and optimize the greatest economies of scale to make money with the smallest of margins on their milk, which is a commodity item. 1,200 cows require a massive amount of feed, most of which is grown in a large adjacent field. The cows produce massive amounts of manure which is collected and composted. Pools of liquid waste flood the far end of the pen. Trent says they can’t use all the compost so they sell one-ton truckloads of compost for around $20 to area farmers. Trent has two employees attaching cows to milking machines, but soon will be switching to a robotic milker in a neighboring barn he recently purchased. His highly efficient operation has silos containing 80,000 gallons of milk. Every day, two semi trucks are filled with Trent’s dairy milk to be taken for further processing. It’s clear that Trent’s farm is a standard industrial dairy farm. It’s not pretty and it smells terrible. 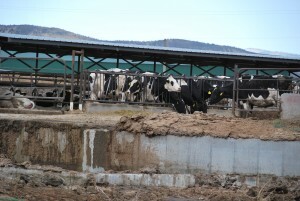 Cows are covered in filth, confined to pens and manure is piled everywhere. Bown’s farm is meeting consumer demands by becoming more highly efficient and cheaper, with cows becoming bigger using more sophisticated feed and drugs. Within the current industrial agriculture model, Bown provides for his family, and consumers expect only a cheap gallon of milk. “Would you ever switch to organic or grass-fed?” I ask.